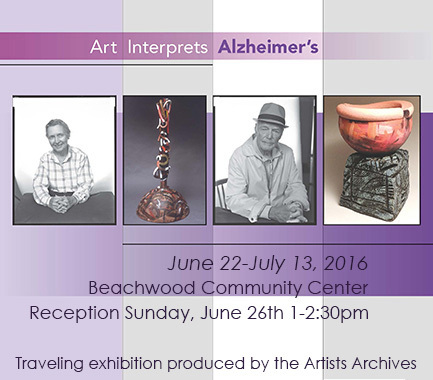 The Artists Archives of the Western Reserve (AAWR) is proud to announce the arrival of its signature Art Interprets Alzheimer’s exhibition at the Beachwood Community Center. The public is invited to attend the free art exhibition and the opening reception which will be on Sunday, June 26, 2016 from 1 pm to 2:30 pm. Art Interprets Alzheimer’s will run through July 13, 2016. Regular community center hours are Monday through Friday from 9 am to 4 pm. A special program featuring Dr. Gary Landreth of Case Western University, Cynthia Davenport of the Alzheimer’s Association as well as artist and caregiver George Roby will be held on Tuesday June 28th, 2016 from 11 am to 12 pm. In collaboration with the Alzheimer’s Association Cleveland Area Chapter the AAWR is helping to promote awareness about this disease. Alzheimer’s is a progressively worsening disease that affects memory, thinking, and behavior of an individual. In its early stages there is mild memory loss but eventually the disease will affect an individual’s ability to do daily tasks on their own. While there are treatments for some symptoms of Alzheimer’s there is no cure available at this time. This important show will showcase the works of talented Archived Artists George Roby and Herbert Ascherman, Jr. George Roby is a respected Ohio potter, sculptor, and teacher who produces functional stoneware using both hand built and wheel-thrown techniques. George’s deeply personal pieces chronical his own unique experience as caregiver for his wife Sue as they faced the day to day realities of her Alzheimer’s diagnosis. Herbert Ascherman, Jr. is internationally recognized for his professional portraiture in creative, commercial, and social settings. In this show, his photography lovingly captures the often complicated relationships between family members and those living with the condition itself. The sculptures and photographs will promote awareness of Alzheimer’s disease, research for a cure, and its effects on the patients, caregivers and the community as a whole. Art can evoke a range of emotions and the AAWR hopes this exhibition will have a positive impact and inform people about Alzheimer ’s disease. The exhibition has toured extensively since its launch in 2012 as part of a continued effort to spread awareness and promote continuing understanding through research. Some important past show locations include the University Hospital, many educational facilities and a special event for the Alzheimer’s Association in Knoxville, Tennessee.